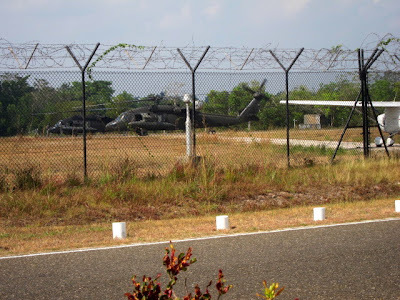 Village View Post: BLACKHAWKS IN BELIZE? In early May while driving to the Belize International Airport I heard the unusual noise of helicopters engines close to the ground. I pulled over to the side of a road and began taking pictures. 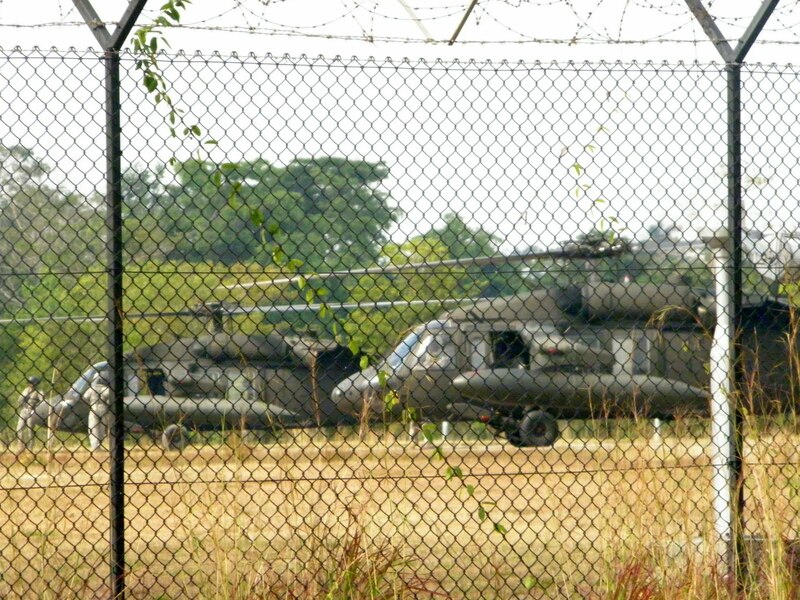 The immediate thought that came to my head was; are these Blackhawk helicopters? 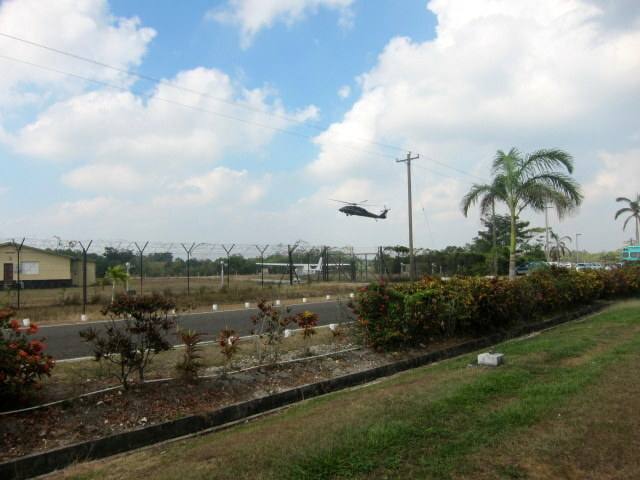 They landed in a large open field near the airport and US Army soldiers began jumping out. With palms sweating, I continued to snap pictures having no idea what was going on. 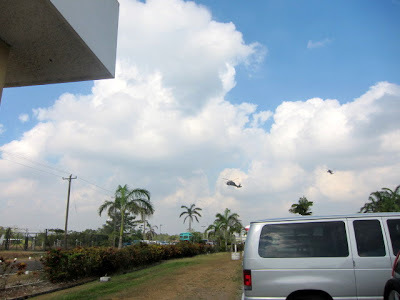 I was so taken with the sudden action I did not notice a black SUV pulling on the side of the road next to me. Four men dressed in Belize Defense uniforms began talking to me and telling me to stop taking photos. 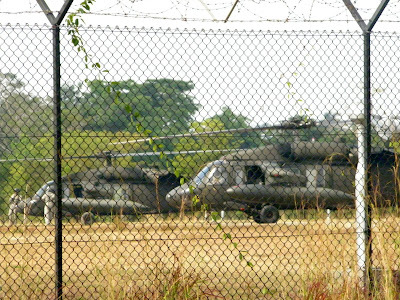 I asked them if these were Blackhawks and what are they doing here. The senior one in the group told me that we can’t answer your questions. I asked him why and he said if we do we will have to get rid of you right away. I told him that it would be a really big “oops” to do something like that, wouldn’t it? He said," it would be a really good idea to get back in your car". I told him that as far as I know this is a public road and I can stay here as long as I want. "Not bad", he said with a smile. I jumped over a nearby ditch and jolted myself out of what felt like a daydream. 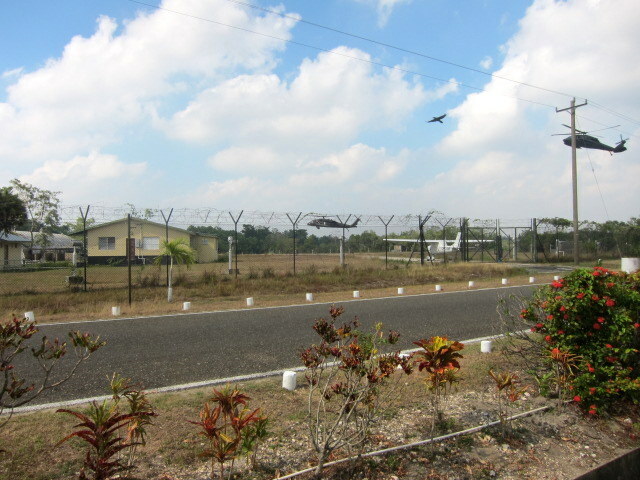 I gradually gained confidence, as I got into my car and continue driving to the airport to pick up my sister. 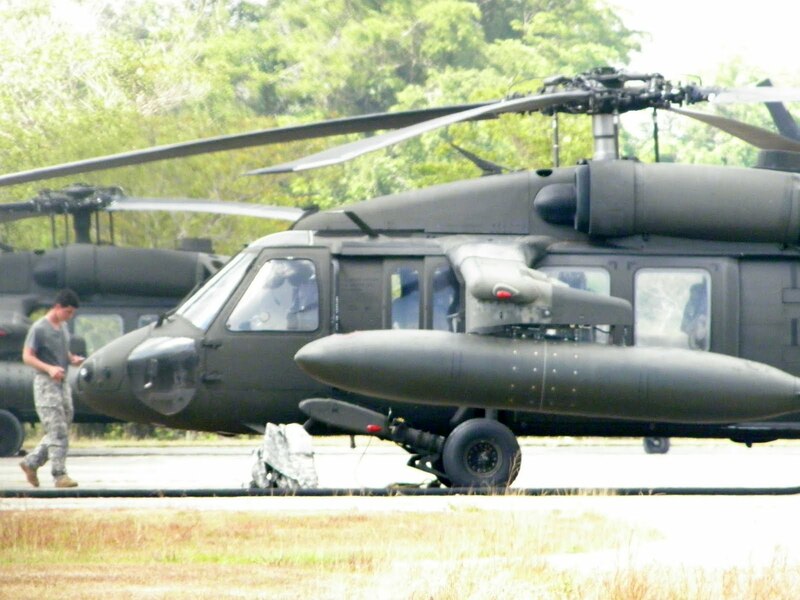 The Black Hawk helicopter is a four-bladed, two engines, versatile Army fighting machine—and it’s the pride and joy of the US Army......this is my last photo before I got into my car. 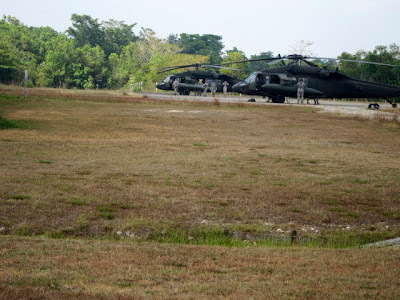 Wouldn't be surprised; after all the US is conducting a lot of operations in Belize! Linda: Blackhawks, my husband Allan used to be a blackhawk mechanic in the army. 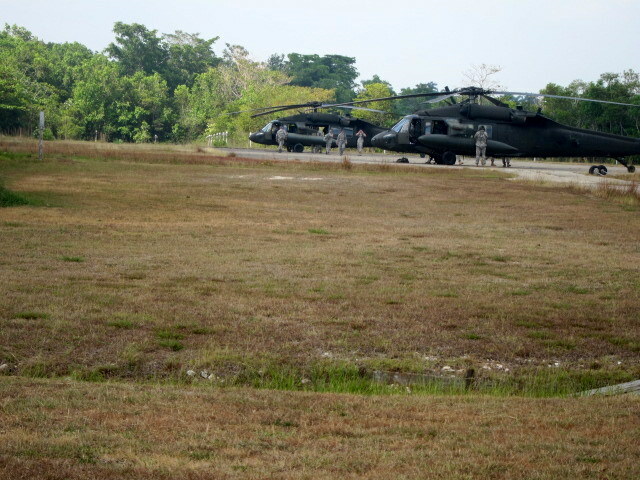 I was there the day they were brought in by two DEA C-17 cargo jets!!!! 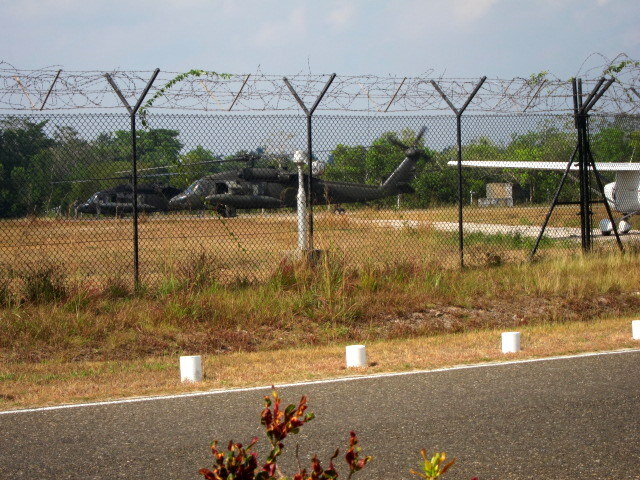 They just had the rotor blades folded back. You have outdone yourself with this one. I think that you have more chutzpah that I do, ad I am know to do some extraordinary things to get the story. Great report and well done. Be careful someone may see this and report you....this seems to be a very hush hush thing. You don't want the USA coming and asking why you posted this. Anonymous: thanks for your advise, but I don't think I have to worry about this one. 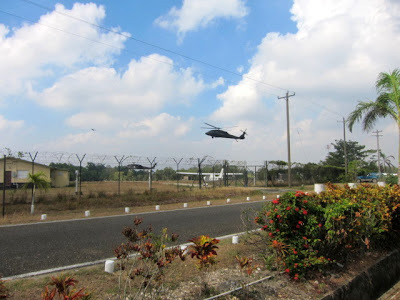 I think standing by the side of the road is not secret at all; besides the US have a secret (so called) base in Belize on Calabash Caye in the center of the East side of Turneffe Atoll. And there are other secret opertions "Robocopter" Spotted in Belize. General I am....but someone have to do it.